^ (PDF) ﻿Census of population and housing, 1969﻿ (Report). Lusaka: Central Statistical Office, Republic of Zambia. (1970). pp. A6-7. オリジナルの2015年10月26日時点によるアーカイブ。. https://web.archive.org/web/20151026014633/http://www.zamstats.gov.zm/report/Census/2010/National/2010%20Census%20of%20Population%20National%20Analytical%20Report.pdf. 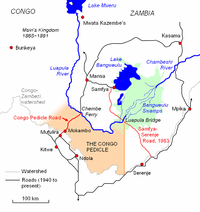 ^ (PDF) ﻿Zambi Public administration Country profile﻿ (Report). Division for Public Administration and Development Management (DPADM), Department of Economic and Social Affairs (DESA), United Nations. (2004). p. 7. http://unpan1.un.org/intradoc/groups/public/documents/un/unpan023293.pdf 2016年10月16日閲覧。. (PDF) ﻿Summary report for the 2010 Census of population﻿ (Report). Lusaka: Central Statistical Office, Republic of Zambia. (2012). オリジナルの2015年10月26日時点によるアーカイブ。. https://web.archive.org/web/20151026014633/http://www.zamstats.gov.zm/report/Census/2010/National/2010%20Census%20of%20Population%20National%20Analytical%20Report.pdf. Mwakikagile, Godfrey (2010). Zambia: Life in an African Country. New Africa Press. ISBN 9789987160112. https://books.google.co.in/books?id=DFVS4IixY5oC&dq=zambia+provinces&source=gbs_navlinks_s. Gould, Jeremy (2002). “Zambia:contesting Democracy”. In Laakso, Liisa. Multi-party elections in Africa. James Currey Publishers. p. 314. ISBN 9780852558430. https://books.google.co.in/books?id=kLvSYzHNTHcC&dq=luapula+province+history&source=gbs_navlinks_s. ﻿Zambia: Poverty Reduction Strategy Paper﻿ (Report). International Monetary Fund. (2007). https://books.google.co.in/books?id=_iAatckEiIQC&pg=PA335&dq=luapula+province&hl=en&sa=X&ved=0ahUKEwink7aw797PAhUXz2MKHc7tAgIQ6AEIHTAA#v=onepage&q=luapula%20province&f=false.